Wandering through the Cooper Hewitt Museum the other day, I came across Thom Browne’s guest installation that was absolutely fabulous, and reminded me just how much I’ve always loved the ground-breaking menswear designer. I’ve been following Thom Brown ever since he won the CDFA award in 2006, and he has since been credited with bringing life back to the men’s suit with his signature cropped tailoring. 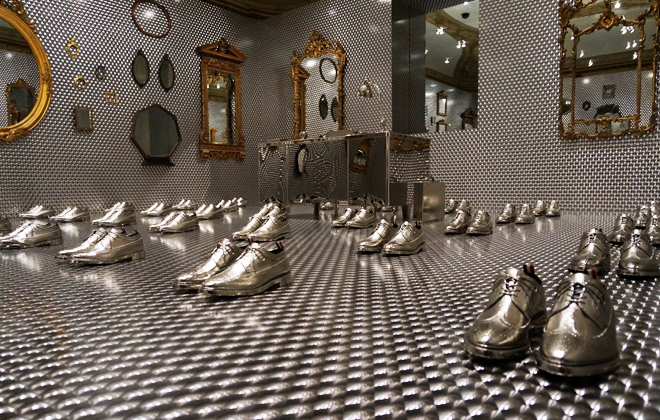 The installation, which Browne curated as part of the museum’s “Selects” series, brought together an array of gilded mirrors from the museum’s collection, along with 64 pairs of silver plated brogues (props from the designer’s past-season runway show), and topped off with holographic wallpaper by Osbourn and Little. I just love the play between new and old, all brought together by the theme of reflection! If you are in NYC, I suggest you head there and see if for yourself. It’s a stunning exhibit that is so well done. Often playing on the idea of ‘uniform’ in his shows, Browne says “somebody that can adapt a uniform for themselves is showing something really interesting about their personality,” although even a standard grey Thom Browne suit is anything but uniform. He truly has ushered in a new era for menswear, lightening up the hems and creating entirely new shapes for men, and now with his own tailoring facility in Long Island City, he can bring production on his made-to-measure suiting to the next level. With the help of the renowned Italian tailor Rocco Ciccarelli, who hails from Rome and brings an impeccable eye for traditional tailoring, the Thom Browne suit remains a staple in menswear, combining the absolute highest level of traditional know-how, with an exciting new vision for what suiting can be. 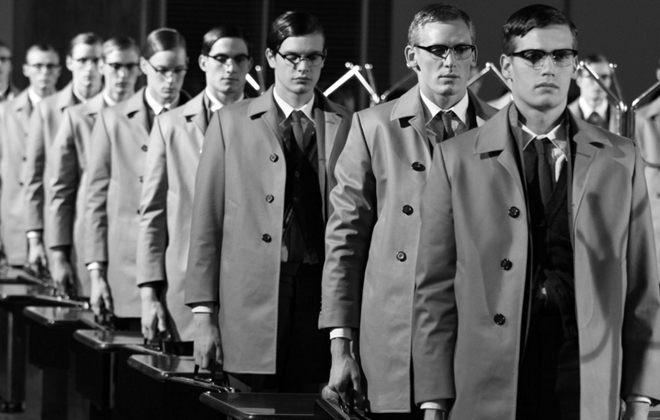 I just love the parade of fantastic trench coats and spectacles. 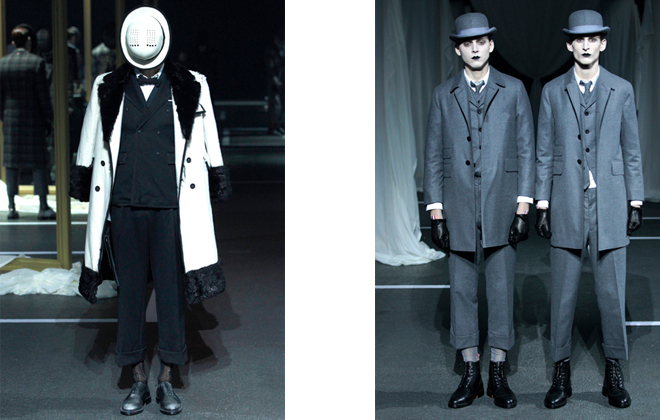 All photos from Thom Browne except cover image by Interior Monologue. Images from the men’s runway FW2016. The man himself. Clearly, he follows his style directive. 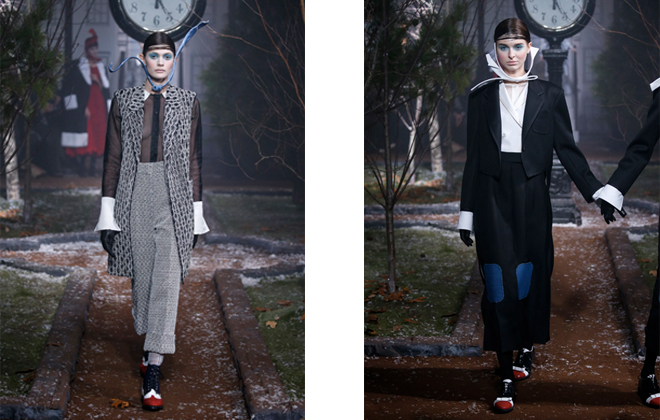 The striking images from the women’s FW 2016 runway.